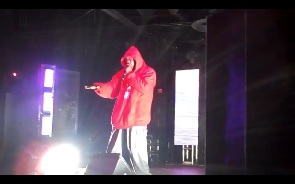 Out on the road for the All 6’s And 7’s Tour, Kutt Calhoun has been busy tearing down stage all across the country. With hits from B.L.E.V.E., Feature Presentation, and Raw And Un-Kutt, his brand new solo set gives fans the best of Kutt Calhoun. While in Sacramento, Kutt kept the crowd moving with “Dark Knights” from Raw And Un-Kutt. Mixed with a little bit of theatrics, the performance proves that all Kutt needs is a microphone to rock a crowd like no other. Have you seen Kutt Calhoun yet on the All 6’s And 7’s Tour? What did you think of his new solo set?